As the Consumer Electronics Show kicks into high gear, manufacturers continue to wow us with new product demos and announcements. Right on the heels of yesterday’s unveiling of an HTC Vive Pro VR headset, today Lenovo reveals it is almost ready to release its own VR offerings with the Mirage Solo and the Mirage Camera with Daydream. Levono claims the Mirage Solo will be the first standalone headset leveraging Google’s Daydream VR platform. The unit will be wireless and will not require a smartphone: everything you need to experience VR cord-free is packed into the Solo. The device is powered by a Qualcomm Snapdragon 835 processor backed up by 4GB of RAM and 64GB of storage. There is also a microSD slot for up to 256GB of additional storage. It will weigh in at 645g and Lenovo claims the 4,000mAh battery can power the headset for up to seven hours on a single charge. The Mirage Solo will feature a QHD 2,560 x 1,440 LED display running at 75Hz which is a somewhat low refresh for VR. It will also have a 110-degree FOV, pretty much the industry standard. 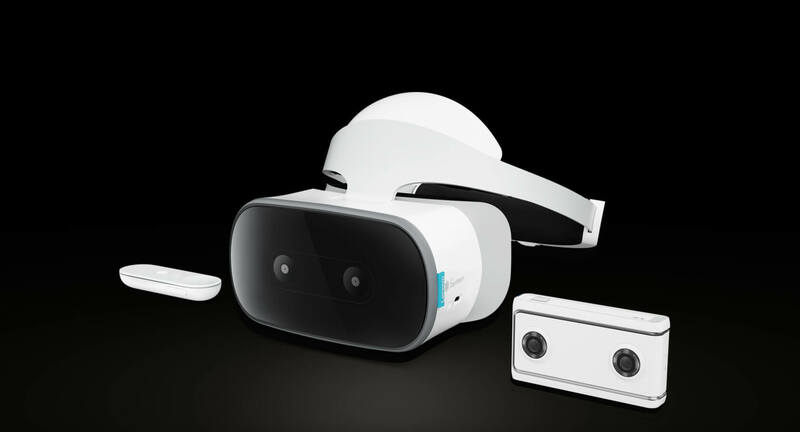 The headset sports dual cameras that will be used for tracking and a Wireless Daydream Motion Controller. Rounding off the tracking and control equipment will be a proximity sensor, gyroscope, accelerometer and magnetometer. No external sensors are needed for this one. The specs are not super impressive for VR but considering it will be wireless, self-contained and priced under $400, they are not too bad. This is, at the very least, a step in the right direction. The dual lenses will be able to capture 13MP images and 4K, 1440p and 1080p video at 30 frames per second. Pictures and video can be stored using the onboard 16GB eMMC or a microSD of up to 128GB. The cameras shoot with a 180-degree FOV. While images and video are easily viewed through Google Photo or YouTube via your web browser or smartphone, the real magic comes from using a VR headset as you can somewhat look around within the scene. Sharing your events and content should be relatively straightforward since the camera is WiFi-enabled with 802.11 b/g/n/ac. Lenovo has included everything to make sharing easy. Measuring 55 x 105 x 22mm and only weighing 145g, the Mirage Camera is not too much larger than a smartphone and comfortably fits in the pocket. Unfortunately, the compact size means they had to sacrifice the battery a bit. Lenovo says the 2,220mAh battery will power the device for up to two hours under general usage situations. Both the Solo and the Mirage Camera are slated for a second-quarter launch. Lenovo failed to pinpoint the pricing but did say the Mirage Solo would retail for under $400 and the camera would sell for less than $300. Check Lenovo’s website as pricing and details solidify.